Madikeri: After pounding the district hard for over 24 hours, rain gave a respite to Kodagu this morning. Though it was a temporary break, it provided people the much needed relief. For officials, it was time to assess the damage and provide relief. The District Administration had said that the rain was due to cyclone Mekunu that hit coastal parts of Karnataka on Tuesday. Private water forecaster Skymet has predicted that cyclone Mekunu may hit Kerala in a day or two and in the process, it might bring heavy rain in Kodagu. Kodagu has received 51.5mm rainfall in the last 24 hours. The District Administration has initiated a 24X7 helpline (08272-221077) to provide assistance to people affected by rain. Tourists in Kodagu are missing the famous musical fountain at Raja Seat, which was damaged by lightning five days ago, and requires another week for repair, officials said. Rain has intensified in Madikeri and Virajpet taluks and there was a continuous rain from Tuesday night to Wednesday. There was a cloudy atmosphere at most parts of the district, followed by drizzle and sunshine. The rain has kicked-off the transplantation activity across the district. From January this year to May 30, Kodagu has received 16.67 inches (423.418 mm) rainfall. Madikeri has received 21.19 inches (614.426 mm), Virajpet 12.29 inches (312.166 mm) and Somwarpet has received 13.53 inches (343.662 mm) rainfall. Due to heavy rain, there is no electricity in most parts of the district and even towns where there are power stations, there is no power. Many residents of Madikeri complained of house wall collapse and trees falling on houses and on electric poles. 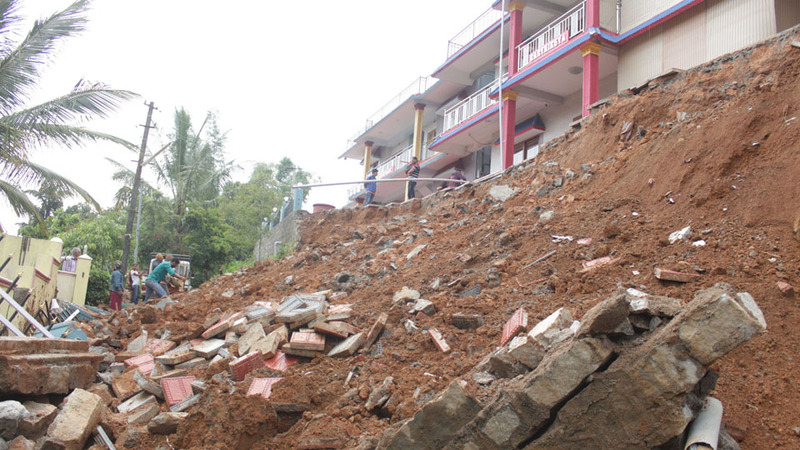 House collapse incidents have been reported from Subramanyanagar, Putaninagar, near Kodava Samaja, Madikeri. Taluk Panchayat Member Sabitha Channakeshava, Gram Panchayat Member Gopalakrishna and the Village Accountant (VA) visited the spot. At Aruvathokkalu near Gonikoppal, a huge tree fell on a house. The house and a scooter that was parked outside the house have been badly damaged. Fortunately no one was present inside the house when the tree fell. The connection between Birunani and Hudikeri has been cut and even the temporary bridge that has been constructed at Hysodlur village is under water.